In The Sugar Impact Diet, New York Times bestselling author JJ Virgin explains the role of sugar metabolism in weight loss. This book describes how foods contain different types of sugars that have unique effects in your body. Foods with a High Sugar Impact cause weight gain, fatigue and inflammation. Low Sugar Impact foods promote fat burning and sustained energy. The Sugar Impact Diet claims if you switch foods with a high Sugar Impact for those with a low Sugar Impact you can lose up to 10 pounds in 2 weeks. The Sugar Impact Diet identifies the most damaging types of sugars that you may be eating every day without realizing it. Virgin says, it is not enough just to cut back on sugar. You need to know what kinds of sugars to eliminate. The program lays out a three-step process to wean you off the foods with the highest and most damaging sugars. Avoiding foods with a high Sugar Impact will allow you to quickly lose weight and get healthier without feeling deprived. The first step is to identify how sugars are affecting your weight and health. You will undertake a quiz to help you pinpoint the high Sugar Impact foods in your diet. Then you will gradually shift away from high Sugar Impact foods to those with a medium Sugar Impact. You will spend one or two weeks in this cycle, depending on the results of the quiz. During this phase you will begin to switch from burning sugar to burning fat. You should start losing weight as well as experience an increase in your energy levels. In this cycle you will switch medium Sugar Impact foods for low Sugar Impact foods. This helps you burn fat even more effectively resulting in rapid weight loss. The average person loses 10 pounds during this two-week cycle. When you reach this phase you will be feeling lighter and more energetic with an appetite for healthy foods. This final cycle is focused on customizing your diet to suit your long-term goals. You will determine how much sugar you can safely include without derailing your progress. This cycle is all about creating a maintenance program that works specifically for you and supports your lasting success. Grass-fed beef, lamb, bison, organic chicken, wild-caught seafood, pastured eggs, organic dairy, black beans, chickpeas, wild rice, quinoa, arugula, beets, cabbage, cauliflower, lettuce, onions, zucchini, butternut squash, tomatoes, avocado, peaches, berries, oranges, passionfruit, coconut milk, flaxseed meal, chia seeds, hemp seeds, almonds, tahini, olive oil, dark chocolate. Virgin recommends a combination of burst and resistance training. On her website she shares a 15-minute full-body workout that incorporates both of these fitness techniques. You only have to do this workout three times a week to rapidly see and feel the difference in your body. 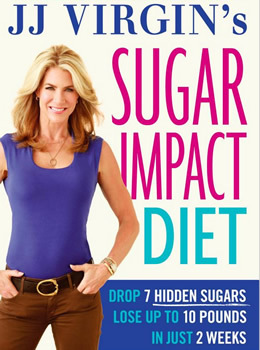 JJ Virgin’s Sugar Impact Diet: Drop 7 Hidden Sugars, Lose Up to 10 Pounds in Just 2 Weeks retails at $26. Sugar Impact Shakes retail at $69.95 for a packet that supplies 30 servings. You don’t need to completely eliminate sugar. Can assist dieters to overcome sugar addiction. Offers advice for eating out. Only requires three 15-minute workouts each week. Limits the intake of fresh fruits and many vegetables. May require more time for food preparation and meal planning. Some people can experience fatigue and discomfort when adapting to the diet. Dieters are expected to go 4 to 6 hours between each meal. Requires the use of the author’s protein shake product. Organic foods can be more expensive. The Sugar Impact Diet helps you identify hidden sources of sugar that may be sabotaging your ability to lose weight. This program is similar to most other low-carbohydrate diets where weight loss can occur rapidly during the most rigorous phase. However, this strict cycle only lasts for two weeks. Then dieters have the option to increase their carbohydrate intake according to individual response and long-term goals.